Our team has evolved over the years, from what started as the passion of one person has now become the enthusiasm and career of many. 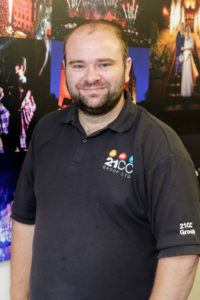 From backgrounds in engineering, accounting, chemistry, electronics, banking, sales, IT and event management, each member of the team brings a unique skill that enables us to create events, set pieces and shows that have won awards; events that we are proud to put the 21CC Group Ltd name to. I have been in the industry since 1999 and I am still enthused about the events that we can create. Products are always evolving and trends changing, which means that it is an exciting challenge to ensure that as a business we are continuing to meet and exceed the demands and expectations of our clients. 21CC Group Ltd started out with the intent to ‘excel in event delivery’ and I believe that is exactly what we are doing, across the board. 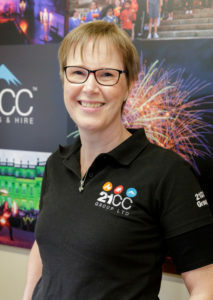 I enjoy the variety of my role, from dealing directly with the clients to being involved in finance planning, strategic decisions and managing staff within 21CC Group Ltd. It is rewarding when we receive the feedback from our delighted clients because we each care a lot about the services and the events that we deliver. We genuinely do put a lot of effort and money into our back office, systems and client care to ensure we are able to deliver at the highest level, and with confidence. We produce, prepare and deliver a huge number of events every week. 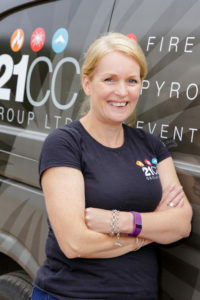 With the different businesses operating under 21CC Group Ltd, an event can be anything from a pair of flambeaux torches and a couple of speakers for a small corporate gig, to a full lighting install, FX on stage or fireworks display. Every event that goes out the door goes through multiple layers of checking to ensure compliance with our event plans for quality control and safety. This means that we can be confident that each event will go exactly to plan. That's my job! I have been part of the team now for many years. The company has grown enormously over this period. Growth is both exciting and challenging. I am the one who measures everything by numbers, reporting regular updates and KPI's to our Company Director. I also manage the systems within the company. Every client we work with seems to remark on our ability as a company and the quality with which we deliver our services as a team. 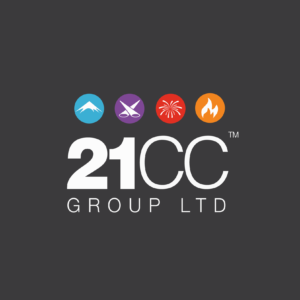 I enjoy the part of my role where I meet with a new client and I can share confidently that 21CC Group will exceed their expectations in the delivery of all our products and services. 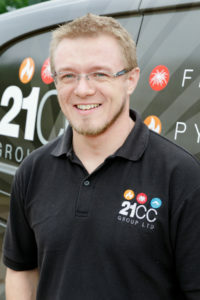 We have a very committed and very strong team here at 21CC and we are very good at what we do! 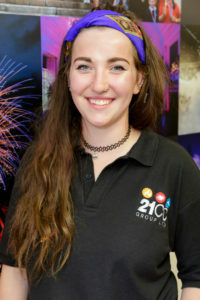 My role here is to plan, manage and help the management team and production team deliver our events safely and successfully. One day I can be working on the plans for a private celebration, the next on a build schedule for Honda. I really do love the challenge and the variety. 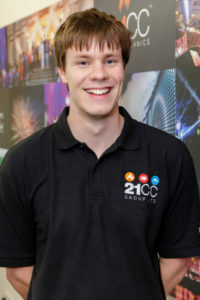 Here at 21CC Group the events we work on are first class. The whole team here are driven to deliver the highest level of customer service. 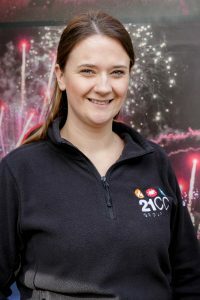 I am responsible for the companies logistics and delivery plans, including collating and logging information for our events, planning crew, vehicles and resources. There is a lot to manage, but we are a great team. As Operations Manager, I oversee the operational planning, coordination and delivery for the whole company. 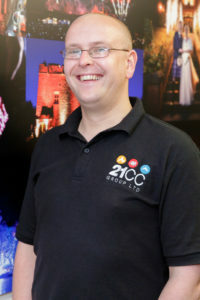 I work with a fabulous team, who are focussed on delivering our events, displays and services safely and successfully. We put the right people in the right places! My primary role is to support our Operations team with event planning and event delivery. I also support our company Director in the day to day workings of the business. There is such a great sense of team here at 21CC. We all work together to ensure we deliver well and exceed our clients expectations. There is a lot of travelling involved with delivering our events. We have clients in the most northern cities in Scotland and the most southern in England. We used to have a time in the year that we called our ‘peak season’. That doesn’t exist anymore! We are busy all year around. On occasion, we can have up to 30 extra vehicles on site to deal with the number of shows and events that we deliver, but that’s my job to sort them! Working with the rest of the display team, I pull together the display information from the database, track department resources and costs, and support the display manager with the administration of the display side of the business. It is a real team effort. The variety of events keeps us on our toes. Last week I was preparing a large festival finale display, this week I am producing multiple shows for weddings as well as an exclusive VIP wedding celebration. No two events are the same so we rely on each other heavily, I think that is why we have such a great team spirit! I get the best job because I get to speak to our wedding clients during their enquiry stage. It is always interesting gaining an understanding of our clients weddings and then telling them of the different products and services that we have that can enhance their big day for their guests. Every client is unique and we treat each one individually. That is a key part of our Customer Service charter. What I love about working at 21CC Group Ltd is the variety of work. One day I am working on the development of the retail business, the next I am working on social media campaigns across all the companies within the group and the next day I am meeting clients and venues. There is a real feel good factor about the team here. Everyone works with one another to get the job done. 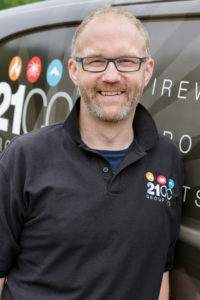 I have been involved in 21CC for many years now and seen it grow from strength to strength. I am an AV tech having worked in the production industry for some time. I enjoy the technical planning and delivery of our events. 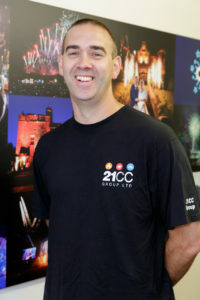 21CC have a large client base, who trust their events to us. That is a testimony to the strength of team that we have here and the quality of service that we offer. 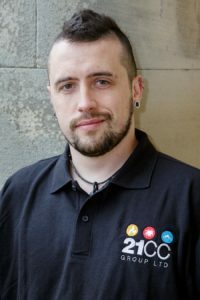 My role in 21CC is within the production business. My degree in sound means that I am perfectly positioned to design and build the right sound system for each event that we do. The combination of event design, kit prep and live events is the perfect mix for me! 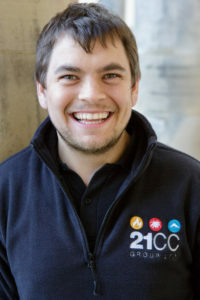 Being part of 21CC Group is great fun. In this job, I help manage the delivery team here at our site. I bring ideas and solutions to the table and I get to see a lot of clients and customers. We have never yet had a disappointed client and we often receive requests for the same products and services year after year. We are definitely good at what we do. 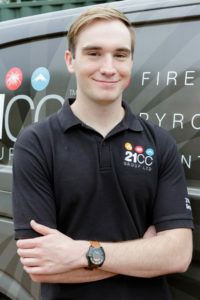 I enjoy being part of the team and getting stuck in to preparing and delivering events. My role can vary from sorting and pulling kit to loading and delivering event materials all over the country. Client satisfaction is key and I take a lot of pride in ensuring our services are delivered well. It is important to me that everything is done right, from cleaning kit to setting up and testing equipment on site. My role varies from day to day, which is one of the things I love here. There is never a quiet day here at 21CC. From loading and unloading vans, prepping kit, maintaining kit, building shows and events, there is always lots to keep up us all busy - and i like that! I have been working with the retail division of 21CC since 2015. I love selling our products and services and putting together sales orders as they come in. It is always satisfying seeing customers smiling faces! My job day to day is to ensure all of our sales orders are made up and ready for dispatch and delivery. I also ensure our stock is rotated and ready for sale. I love helping customers choose what products are right for them.